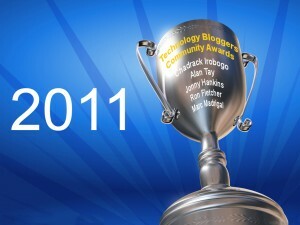 At the end of 2011, here at Technology Bloggers we are going to celebrate with an award ceremony. We are a community blog, and thought the year, loads of fantastic people have been working on continuously improving the blog, taking it to new heights! Now, at the end of the year, we shall celebrate the people who have helped make this blog the huge success it is today. This year the awards have all been awarded by me (Christopher Roberts) as a member of the admin team. However next year I hope that we can vote on the awards, so that the community decide who in the community deserves the award. So, without further ado, the awards! Rising Star – Who is really going places? Who is helping to improve the blog and has great potential? Most Friendly Member of the Community – Who has been the most pleasant and kind person on the blog this year? Top All Rounder – The big one! Technology Bloggers ultimate award, who is the best example of a fantastic member of the community? Diana Studer – Diana has taught me many lessons about respect in blogging and always writes very interesting and thought provoking comments! Chadrack Irobogo! Pleasant mannered and well written, Chadrack’s comments often bring new information and ideas to the table, which help to improve the community. Jonny Hankins! With 8 articles in his inventory, Jonny is quickly gaining experience and becoming a very good writer, who is liked by the community. Ron Fletcher! Ron has been a great contributor to the blog since he joined us in July, he is getting really good at replying to his commenters, is writing more and more, and what he is writing is getting better as time goes on. Here are the 2011 nominees who didn’t get an award. They are also very deserving individuals, and I urge you to check out their sites! I know I have only mentioned a few people, but it is all of us that make this blog what it is, so thank you everyone! This is the forth in a series of articles in which I hope to share with you my knowledge of how and why Technology Bloggers has been so successful, so fast. Learn more about this series by reading our Technology Bloggers success article. In economic terms, competition breeds quality, choice, low price, innovation and efficiency. In blogging terms its a great way to increase your long-term commenters and therefore your reader base too. When starting up a new blog encouraging competition is one of the best ways to engage your readers and attract new ones; fast. 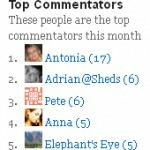 Last month Antonia was the top commenter followed by Adrian from Shed Plans, Pete, Anna and finally Diana from Elephant’s Eye. All the people mentioned have dofollow links on every page of Technology Bloggers, to a site of their choosing. But, it’s only the top commenters who get this privilege. This encourages people to visit the blog, to read and comment more to get links back to their site. You could argue that people will just throw out any random rubbish in their comments and get to the top with ease, but I won’t allow this. Our commenters know (or they should) that I rigorously check through every comment on this blog – with a little help from our spam filters. 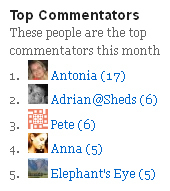 So basically what I am getting at is that if you want to encourage more people to comment, use a top commenters widget plugin. I have our widget reset every month as this means that someone can’t get so far ahead that they are almost impossible to catch up! In the past I have thanked everyone who has contributed to Technology Bloggers success. This includes dofollow links to commenters and authors sites, further incentive to comment. In the future I have plans to introduce competitions to the blog, where entrants will be rewarded in some way or another for participating. I believe that this will also encourage more people to visit the blog, as competition gets people excited, it gets people interested, and it makes people want to stick around.